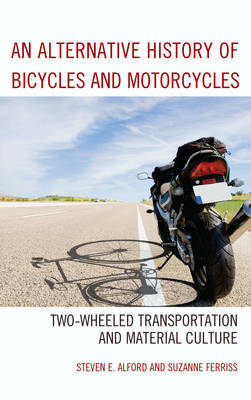 An Alternative History of Bicycles and Motorcycles: Two-Wheeled Transportation and Material Culture accounts for the nineteenth-century creation and development of two-wheeled vehicles, both human-powered and motorized. Specifically, the book focuses on the period from 1885 (which saw the appearance, simultaneously, of the Safety bicycle and the Einspur, the first motorcycle) to 1920, while exploring implications for later bicycling and motorcycling. We argue that invention of these vehicles, rather than the product of gifted individuals, should be seen as the consequence of a number of historical, economic, cultural and political forces that intersect so unpredictably that the notion of a genius inventor is reductive. The common evolutionary model of development from the bicycle to the motorcycle oversimplifies both the technology and its origins. Stripping the vehicles of all their material and cultural associations, such a model fails to advance our understanding of the devices, their creators, and their riders. Taking a contemporary vehicle and tracing its lineage creates a false sense of evolutionary necessity in its creation, and fails to account for the many possible developmental paths that were, for whatever reason, abandoned. By contrast, our book adopts a material culture approach, a form of inquiry that stresses the connections between artifacts and social relations. We consider not simply the bicycle and motorcycle as material objects but focus also on the complex socio-political and economic convergences that produced the materials, materials that in turn themselves shaped the vehicles' appearance, function, and adoption by riders.